YES, YOU CAN SURPRISE YOUR FAMILY WITH SUCH A PLAIN DISH AS FRIED EGG OR PANCAKES! 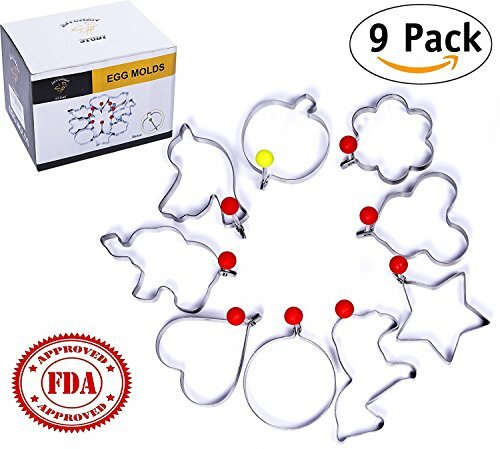 JUST USE OUR "God's Kitchen" RING MOLDS TO MAKE COOL UNIQUE SHAPES AND YOUR KIDS WILL BE EXCITED AND HAPPY! EASY IN USE All you need to do is to spray the molds with some oil - and they are ready to delight you with unusual shapes of usual products! After usage, the ring molds are easily cleaned with dish soap or in dishwasher. 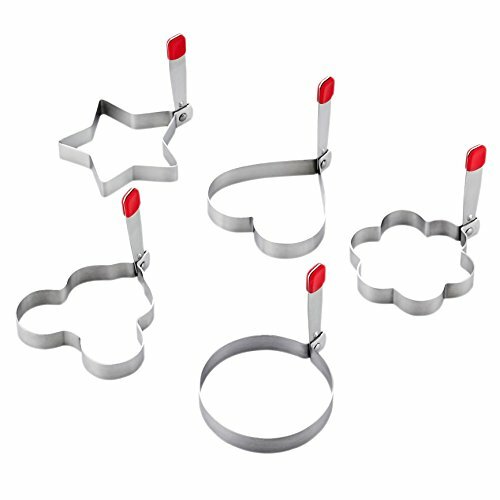 SUITABLE FOR VARIOUS PRODUCTS Our ring molds have a wide range of application - you can use them as a shape maker for eggs, omelet, crumpets, pancakes, meatloaf and patties or as a cutter for cookies, biscuits and cakes. HIGH QUALITY MATERIAL Non-stick stainless steel is used in production of our ring molds. 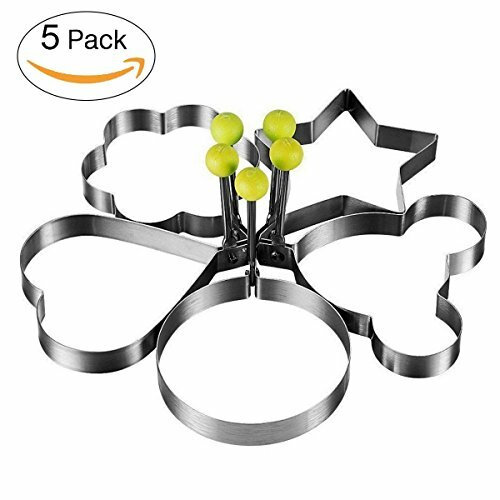 It provides easy removal from the product and is safe for cookware. CUTE AMUSING SHAPES Set includes: 1. Heart Shape: 4. *3.4*0.4 in; 2. Round Shape: 4*3.14*0.4 in; 3. Flower Shape: 3.93*3.14*0.4 in; 4. Star Shape: 3.93*2.75*0.4 in; 5. 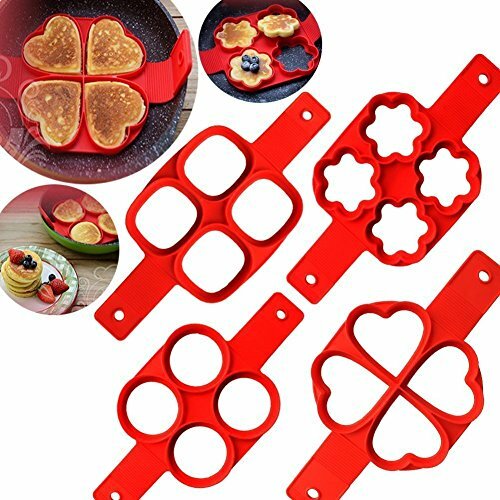 Mickey Mouse Shape: 3.5*2.75*0.4 in; SURPRISE YOUR FAMILY WITH UNUSUAL DISHES AND ENJOY THE QUALITY OF OUR KITCHEN TOOLS ALREADY TODAY! CLICK ADD TO CART AND BUY NOW! Dishwasher Safe: Some stainless steel cooking moulds are not easy to clean, but not this one. Tips- When you're using it, please spread blended oil first on the egg ring, which can avoid sticking to the fired pan while create perfect shapes. 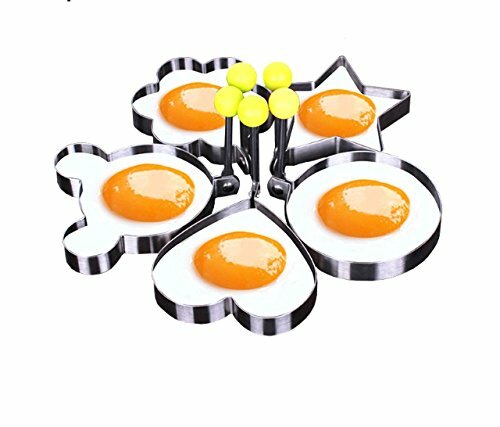 It will also prolong the egg frying mold's life span and make it more durable. The egg rings can be washed by hands and dishwasher. Just rinse them under the tap or pop them into the dishwasher - easy to wipe clean. The baking mould will be as good as a new one after being cleaned. Life can be so easy! 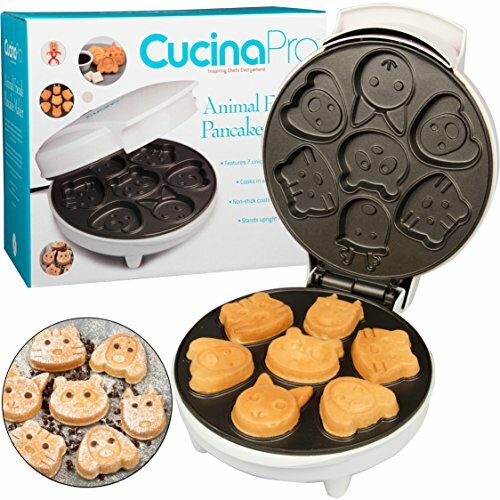 Animal Pancake Maker- Animal Shaped Pan Cake Pan Griddle w 7 Adorable Shapes- Electric Non-stick Cooker is a Great Valentines Day Gift- Make delicious homemade pancakes with adorable animal face shapes. Cooks pancakes effortlessly in as little as 3-5 minutes, and features a non-stick coating for easy clean up. When you're finished the pancake maker stands upright for easy storage. 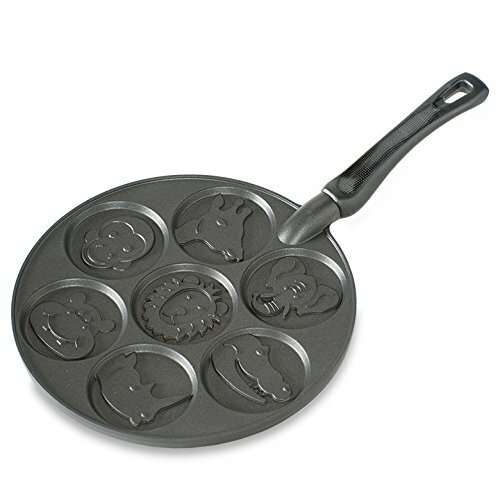 Make thin light 3-Inch pancakes, blinis and blintzs in fun shapes with this holiday pancake pan. Use you favorite recipe or use the one included with the pan. Has seven fun shapes: monkey, hippo, giraffe, elephant, rhinoceros, lion and alligator. Made in USA with imported handle. EASY TO USE 1.First pour a little oil into the wok. 2. Dip a little oil on the mold and then put it into the wok. 3. Pour the eggs slowly after hot pot. 4. After modeling, slow fine fried and then flip over. 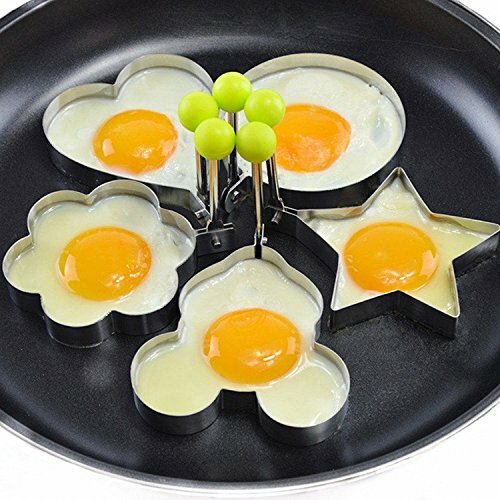 Premium Quality Our egg molds are made of 18/8 stainless steel and fully surgical-graded stainless-steel interior and outside, which gives it a brilliant, durable, rust-resistant finish that is easy to maintain,and will last a lifetime. 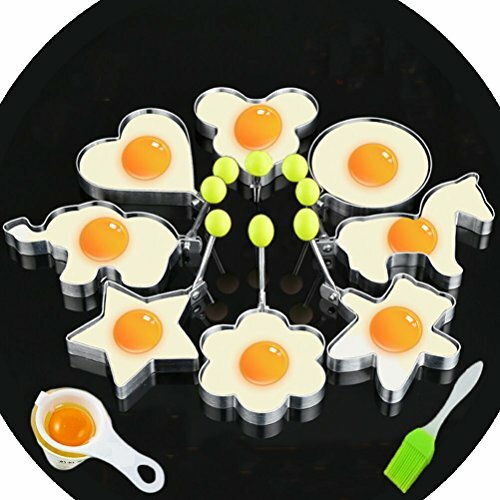 Warranty Service Any problems with your egg molds,please feel free to contact us.